April 4, 2007: Cloudy and warm, Water Temp 63* and clear. Picked clients up at 6 and went in search of bait. Threw about 60 times and caught 36 baits . The forcast for today is 25 mph winds and thunderstorms so I want to get baits out soon before the wind starts to howl. Set up a spread on a flat and soon as I got 11 lines out we started getting hits. 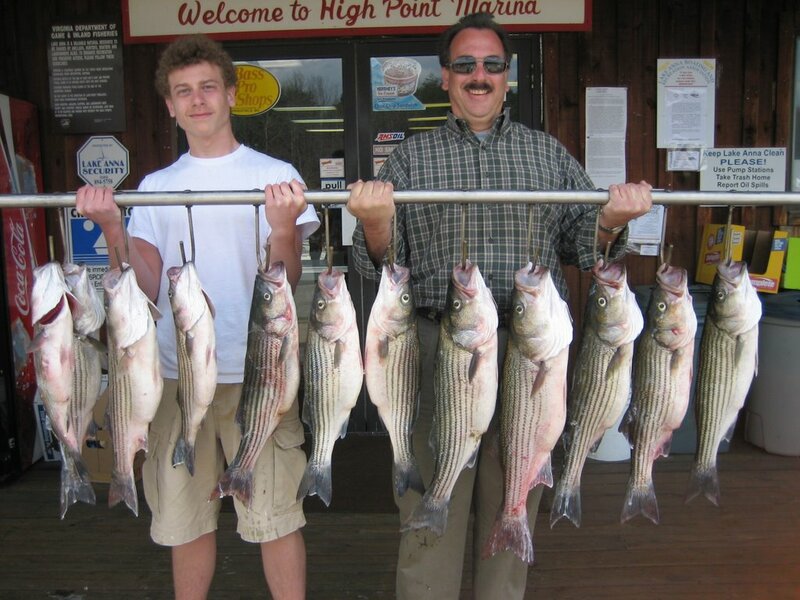 Andy hooked a hog and handed it off to Matt and Matt fought it all the way to the boat beefore it just pulled off. Meanwhile Andy fought his to the boat and we landed it. Within the next 10 minutes we had 8 hits and either tangled other lines up, broke the fish off or they just pulled off. Fifteen minutes into the pull, 10 fish on, 1 in the boat, doesn't look good. I retied my lines and continued to fish getting strikes about every 5 minutes until I looked into the bait tank and all the baits were gone. We pulled the remaining 7 baits in and went and caught more bait and set up on another flat. Our ratios got a little better on this pull, clients boating 1 out of every 4 strikes. Started to run out of bait again but a good friend brought us over 20 fresh ones so we picked up and hit yet another flat. Well, my clients finally caught on and we put more fish in the boat. 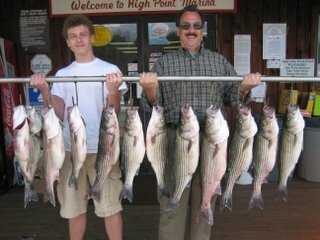 Lost count of strikes after 40 but clients kept 12 nice Stripers and Matt probably will be sore tomorrow.